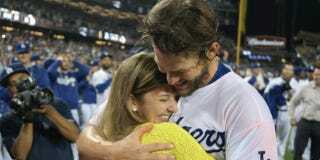 One of the best things about Clayton Kershaw's dominant no-hitter is the fact that Kershaw's wife, Ellen, was there to witness the whole thing in person. The broadcast showed Ellen watching nervously from the stands throughout the night, but things really got good when her husband finally recorded the last out. First of all, what the hell was that usher doing? Let the woman celebrate, lady! Secondly, that was a perfectly executed "I'm so nervous with you!" to "Ohmigod I'm so happy for you!" transition by Chad Billingsley's wife. (She nailed the hug, too.) And finally, if watching Ellen Kershaw freak out and weep tears of joy doesn't make you feel good, you are a jerk.